Please note: This show has been rescheduled to Friday, Sept. 14. Rusted Root, the multi-platinum sextet out of Pittsburgh, evolved around front-man Michael Glabicki’s distinct sound and grew into a musical entity that has thrived in a non-genre specific category all its own. Rusted Root built their career around dramatic performances; their polyrhythmic, multicultural rock-and-soul picked up fans like a junkyard magnet as they swept across the nation on tour. 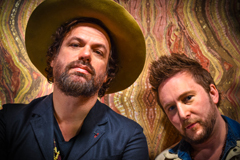 Having just released their eighth studio album, “The Movement,” Rusted Root continues to maintain a strong foothold in the world/jam/rock world. In addition to the two decades with Rusted Root, Glabicki is exploring new sounds and opening new doors with his solo career. He has started touring nationally as a duo act with Rusted Root bandmate Dirk Miller, and explains that although he has his roots with Rusted Root, the sound is very different. Glabicki has always invited the audience to participate in the creation of Rusted Root’s music. He frequently tests new songs on the road to see the fan reaction. Constantly writing new material, Glabicki finds that some of it fits his solo sound better than Rusted Root’s. Glabicki currently routes his solo tours around the Rusted Root schedule, and has multiple performances throughout the year. While not on tour with Rusted Root or working on his solo career, Glabicki also has started his own studio, Red Cloud in Pittsburgh. What started as a place for him to write and record new songs, has now grown into a full scale studio where local musicians can rent space to work on their new albums.